Meet Maria Audete do nascimento the adult Brazilian baby. at the first glance you would thought that she's only 9 months old. but the fact is this baby is born on 7 may 1981 which means now she's 30 years old. This poor baby got a rare disease that cause her to stop growing. It was said that she can't even talk. Maria Audete do Nascimento suffering from a rare disease which apparently could be cured, if she was given appropriate medication at birth. Maria belongs to a poor family, living in a mud house in Ceara, Brazil. Her family consists of her father and his second wife, who has been caring for her ever since her own mother died, 13 years ago. The family cannot afford to provide any form of treatment for Maria, whose condition could have been reversed if treated at birth. For now, she continues to live like a baby, unable to tend to her own needs, and unable, even to speak. The home in which Maria lives, however poor, does not seem short of love. Her step-mother, Dora, has taken care of the woman-child since the day she was married. Experts from the Faculty of Medicine at the University of Ceara believe that what Maria suffers from is a severe deficiency of the thyroid hormone. As a result of hypothyroidism, her body was never able to develop physically or mentally. 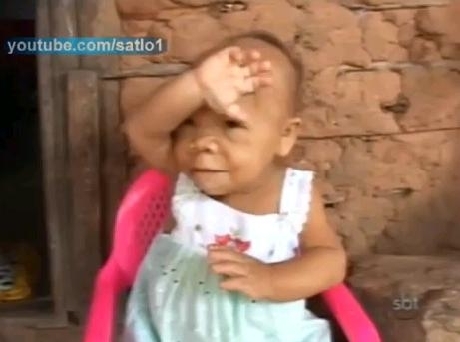 Below you can see the video of Maria Audete do nascimento the Adult brazilian baby. Poor girl, I think her mom could be one of the reasons why she ended up with this condition.